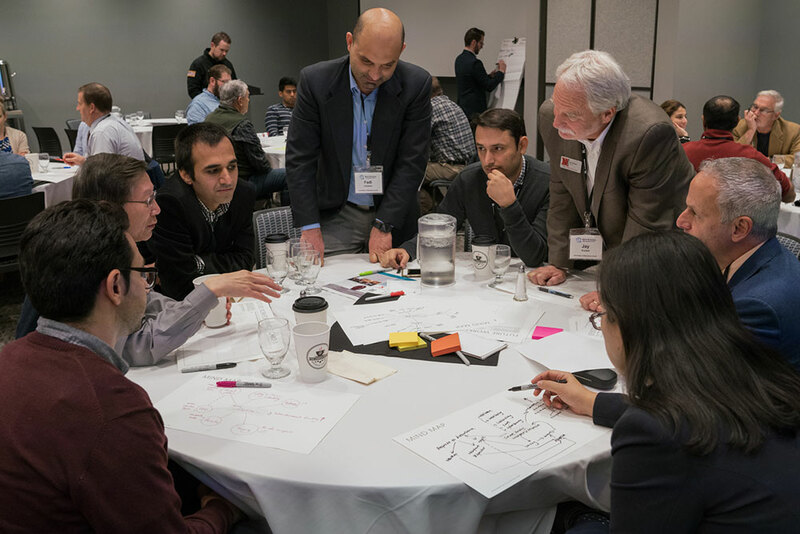 Fadi Alsaleem (standing left), assistant professor of architectural engineering, and Jay Puckett, director of The Durham School of Architectural Engineering and Construction, lead a discussion during the afternoon session Nov. 9 at the Smart Building and Internet of Things workshop. 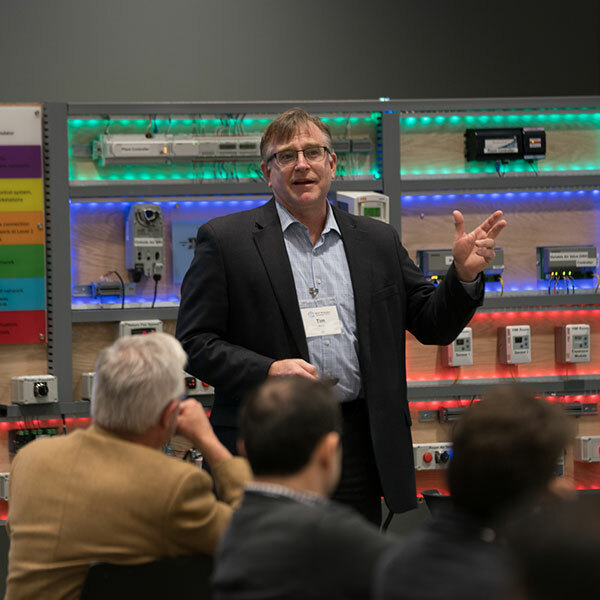 Timothy Koch, vice president and engineering principal at HDR Inc., discusses "Industry Challenges - Design, Construction and Operation of SBIoT Systems" during the Smart Building and Internet of Things workshop on Nov. 9 at Scott Conference Center. Big Data and digital technologies have already changed the world, with smartphones and smart watches that help people manage their lives and gain more control over their environments. With the first Smart Building and Internet of Things (SBIoT) workshop, hosted on Nov. 9 by the Durham School of Architectural Engineering and Construction, researchers from the College of Engineering joined with industry partners on finding ways to integrate these technologies into buildings. The nearly 70 people attended the SBIoT workshop at Scott Conference Center in Omaha, including 12 speakers from organizations and companies such as Emerson Commercial & Residential Solutions, Amazon, the U.S. Department of Energy, Pacific Northwest National Laboratory, Center for the Built Environment, and Nebraska Applied Research. Also speaking was Lalit Agarwal, the University of Nebraska-Lincoln’s director of utility and energy management. HDR Inc. was instrumental in organizing and hosting the conference. Other members of The Durham School organizing team were David Yuill, professor of architectural engineering; Iason Konstanzos, assistant professor of architectural engineering; and Mostafa Rafaie, doctoral student in architectural engineering. Particpants in the workshop embraced the task of integrating this new technological revolution in an area that has seen great, but incremental innovation over millions of years. Alsaleem said making those changes would constitute a relatively fast change for the architectural and construction industries. The changes that will come in these areas, Alsaleem said, are most likely to occur in two paths – helping industry to understand, adapt to and implement these technologies; and creating academic curricula to prepare students for careers in a rapidly changing industry. Alsaleem said the Durham School and its director, Jay Puckett, are considering how professionals can be responsive to the needs of industry as demand grows for engineers who understand how to use these technologies. In the near future, Alsaleem said, there will be courses in building with the new smart technologies. Then will come talk about Nebraska adding smart building as a minor for architectural engineering and, possibly, even adding it as a degree program.